Please click here to open our availability calendar in a new window. Gilwern Hill Trilobite Quarry - The morning is spent at Gilwern Hill trilobite quarry. 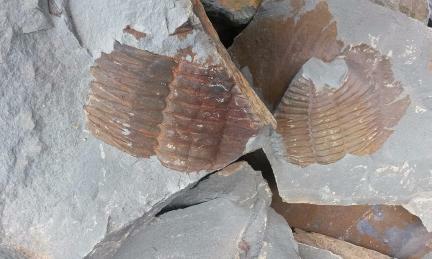 This is the best place in the UK to find and collect trilobite fossils. Llanfair Quarries, Llandrindod Wells - The rocks are Ordovician in age and are the highly fossiliferous Llandeilo-Caradoc shales, siltstones and mudstones. These are intruded by dolerite. These quarries are SSSIs due to their importance for studying fossils of Ordovician animals and their environments. They are also all highly productive. A variety of species have been recorded from the site, including the characteristic graptolite, Nemagraptus gracilis, and the trilobite, Ogygiocaris buchi. Cwm Craig Ddu - The rocks exposed in the roadside cutting are Silurian age siltstones, which are 420myrs old and part of the Pterinea Beds, Wilsonia Shales Formation, Ludlow series. 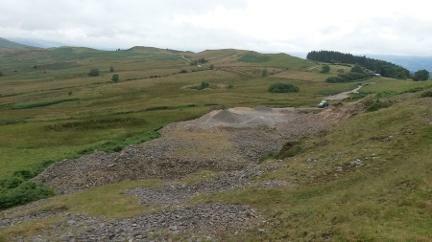 The site is classified as a SSSI, because it contains the fossilised remains of the earliest vascular land plants yet to have been found in the UK. This particular group of plants contain specialised tissues to carry nutrients and water throughout the plant. Plants living today that use this system include trees, grasses and ferns. All the fossilised remains in Cwm Craig Ddu Quarry belong to the genus Cooksonia, one of the most primitive vascular land plants found in the UK. You will need to examine the rocks carefully, as fossils from this site are very small. The roadside cutting was designated a SSSI due to its importance for primitive vascular land plants. However, these are rare and the higher beds in the old disused quarry containing them are mostly overgrown. Instead, what you are most likely to find are small bivalves within the siltstones. These may be small, but are remarkably well preserved. They can be found almost anywhere, but are mostly collected by splitting fallen rocks or other loose material within the embankment. This site is also a magnificent example of a glaciated valley. The Epynt Centre, Disgwylfa - We walk along the Epynt Way for half a mile each way learning about the Geology of Myndydd Epynt which is Devonian and we learn about the Townsend Tuff bed. There is a small climb to the last site so a walking stick might be useful. The Twmpath, nr Erwood We admire the magnificent views of the Wye Valley and Aberedw Rocks. We discuss the glacial features and examine the Silurian rocks that contain occasional brachiopod fossils.